Andy from handprint.co.uk kindly offered some help with our silkscreen idea. He sent some diagrams to explain why exposing UV emulsion on a silkscreen is better done from a distance and not from the minimum distance required, based on the lens angle of the LED. What he said makes perfect sense – and we’re really glad of his input, otherwise there’s a very real chance we’d have ended up with some half-baked boards! (or more specifically, some over-baked boards, but you get the idea). Andy explained that the silkscreen is basically a mesh with so many threads per square inch. 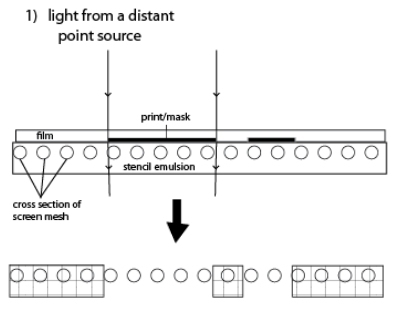 The idea behind coating the silk with emulsion is not to leave a film on top of the silk, but to use the emulsion to block all the holes between the threads. Then placing a mask image between the screen and the UV source results in only parts of it being hardened by the UV light. It’s quite possible that light could “leak under” the masked area from LEDs adjacent to it, resulting in parts of the screen getting too much UV light. 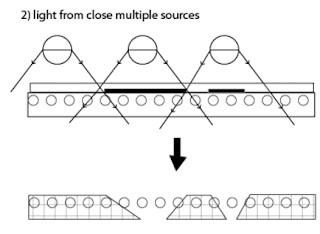 Andy suggests that the further the light from the screen during UV exposure, the “straighter” the light passing alongside the sides of our mask image, and the cleaner the image should be on the final screen. We’re really grateful for this advice – one thing we were considering when making our box/enclosure was to line the inside of the box with a reflective surface, presuming that this would allow the UV light to bounce around and, in theory at least, provide more UV light to the screen, improving exposure times. It turns out, however, that this is exactly what we don’t want! We don’t want UV light hitting the screen from the sides of our UV box, as this would mean it’s travelling at an angle to the screen (and the mask image) rather than perpendicular to it. So already we’ve learned something – and that’s we don’t want reflective material inside the box; if anything we’re thinking we should paint it black and increase the box height from 35mm to about 80mm or 100m or more!